Did you know that January 21 is "Dia de Altagracia" or "Altagracia Day" in the Dominican Republic? 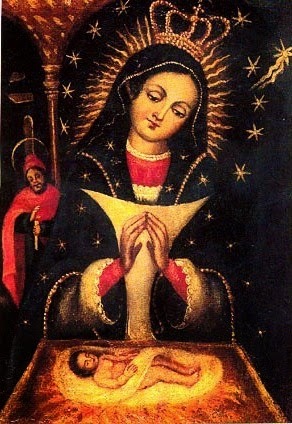 It is a huge feast day and public holiday commemorating Our Lady of Altagracia, protector of the people of the Dominican Republic. Did you also know that Passaic, NJ is #11 in the top 25 U.S. communities with the largest Dominican populations? Put these two Wikipedia facts together and you get not only a whole lot of Altagracia devotion last week, but also a whole lot of learning for those of us new to living in Passaic! Due to ministry schedules, our convent community has been attending many daily Masses at 7 pm during the past few weeks. Most of these are Spanish-language Masses, so we are enriching our Spanish liturgical vocabulary and our "devotional competencies," if you will. As we started noticing an increase in the "Altagracia Novena," we became more aware of the image (as seen at the top of this posting; e-mail subscribers, click here if you do not see the image) and of the Dominican devotion to her, but we remained unaware of the January 21 feast day -- that is, until we went to the 7 pm Mass on January 21! Two hours later, we headed home with a greater understanding of the importance of the Virgin of Altagracia to the people with whom we live and minister (and with the fragrance of copious amounts of incense emanating from our clothing). This two-hour liturgical celebration -- including my first prayed-in-common Spanish rosary -- was a surprise. We were simply expecting to go to Mass and go home, as usual, but other plans had been made for us -- plans involving "high grace" (literal translation of "Altagracia"). Always begin with wonder . . . but do not end there! As this novena began in the middle of January, I wondered: What is this? Why is this happening in the middle of January? Is this one of those novenas that is year-round and we are just being introduced to it now? What is the meaning of that image? Why have I never seen it before? However, just as quickly as I wondered these things, I forgot about them by the time I got home, where there were other things to tend to before going to bed. I never really delved into it, except for Googling the image. I also admit (in an embarrassing way), that I did not ask anyone with whom I prayed the novena prayers after Mass to explain what was happening. My learning: If wonder does not lead you to explore further and to form and strengthen human relationships, what good is wondering in the first place? There is always a message . . . Wait for it. During the two-hour liturgical experience, I said to myself (and out loud once or twice), "There is a reason why we are here." Usually when I say this, I am thinking that there is someone who might need prayers or help or simply to talk. I prepared myself for those possibilities. Upon reflection, I realized that there was a reason why we were there, but it had little to do with anyone else needing something from us. On the contrary, it had much to do with my needing to slow down, to attend to the prayer being offered (especially when it differs from the prayer I was expecting) and to pay attention to the devotion of this faith-filled community who welcomed us to pray during one of its most significant feasts. My learning: When considering God's message, expect the unexpected. "High grace" is always being poured . . . Never refuse it. Had I bothered to find out the significance of January 21 ahead of time, I would probably not have attended the 7:00 Mass that evening. After all, we had a schedule that allowed for the efficient operation of our ministries and of our convent that day. The schedule did not allow for two hours in church that evening! Another Mass would have been much more consistent with our plans that evening. But God's abundant -- even "high" -- grace was awaiting my awareness. God, who cannot be outdone in generosity, was pouring grace, even before we arrived at the church. What made us say, "We haven't been to a 7:00 Mass at St. Mary's yet; let's go there"? What made me stay, although incense -- especially in such huge amounts -- makes me physically ill? What made us "tough it out" for two hours, especially when two of the three of us are novices in the Spanish language? One word: GRACE! My learning: Pay attention to the grace! Do not run from it, try to catch up with it or refuse its seemingly inefficient nature. Be in the grace-filled moment. Please consider learning more about Señora de Altagracia. Start here if you have some time, but don't stop there. You do not want to miss out on the grace! From your hands and your maternal heart we receive each day the sustenance that you give to us from Our Father in heaven. You are our defense in danger, our indispensable help in our necessities and our hope in the sacrifices required of the Christian life. Through your Immaculate Heart we desire to pay tribute to God with a hymn of thanksgiving for all the benefits you have distributed. We promise you, Oh Mother, gratitude and fidelity. You will always reign in our homes and in our town, where all venerate you as Our Lady and Mother, you who make all virtues increase and thrive. We are honored to be called your children. We hope to finish our lives serving God and you until we reach the highest grace possible, the grace you will help us to attain, the great gift of heaven itself. What progress our artists have made in three months' time! Please take the time to look at the beautiful artwork of Sr. Mary Culhane's class. This week, they completed their pastels and moved on to still life. (E=mail subscribers, if you do not see photos embedded in your e-mail, please click here.) We remain grateful to the Sisters of Charity of St. Elizabeth, Convent Station, for their generous grant to fund the art program.